Yes, we were totally inspired yesterday by the astonishing, gorgeous raspberry tart at Nathalie’s Gourmet Studio. I think I might have become too excited, and pushed myself too hard, because last night I slept for over 12 hours. But today, I am feeling better. Not 100%, but good enough to write down this recipe. AngelKitten and I decided to make ice cream. I knew I had a whole bunch of passion fruit from my organic delivery guy and so I suggested we start with that. But we were still obsessing about the raspberry tart, and so we decided to make a swirl of flavour – the tart brightness of passionfruit melded with the lush ripeness of raspberries. We also felt that the colours of both together would be beautiful … and oh what a pretty sight the final ice cream is! Gorgeous, happy making. And the taste is out of this world. We started by making a double batch of vanilla custard which would serve as the base for the flavoured ice cream. If you dont want to add vanilla, leave it out, but for me, at least, the combination of the fruit and the vanilla is outstanding – the vanilla adds a musky note that helps the two flavours to meld. Its also one of my favourite flavours ever, and I just wanted to add it! We wanted to end up with about 5 cups of vanilla custard, and we also wanted about a cup each of flavouring. Making ice cream is relatively simple, but you need to keep in mind the varied sweetness of the different elements you are adding to the mix. Because the fruit was not very sweet, we added sugar when we boiled it down – and therefore, we subtracted that amount of sugar from the custard. We also added only 8 egg yolks (4 per batch) – whereas most ice creams use 6 egg yolks per 3 cups of milk/cream. We wanted to keep the fruit flavours foremost (say that 3 times fast), and felt that 4 yolks per batch would ensure the creamy silkiness of the ice cream, without making it too French custard-y. 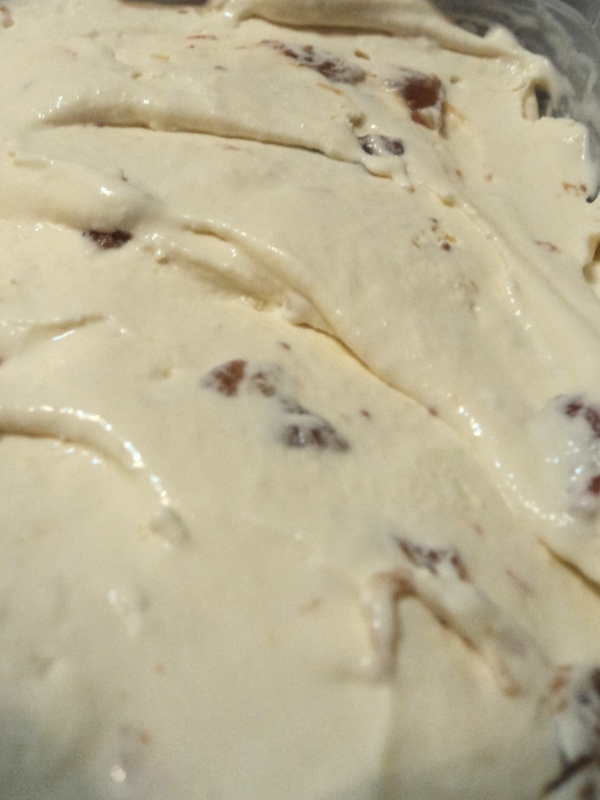 Finally, it was a simple process of mixing up 2 batches of ice cream in the ice cream maker, and when they were both still soft, combining them in a large serving container. We then just used a knife to ripple through, and let it all freeze and bloom overnight. 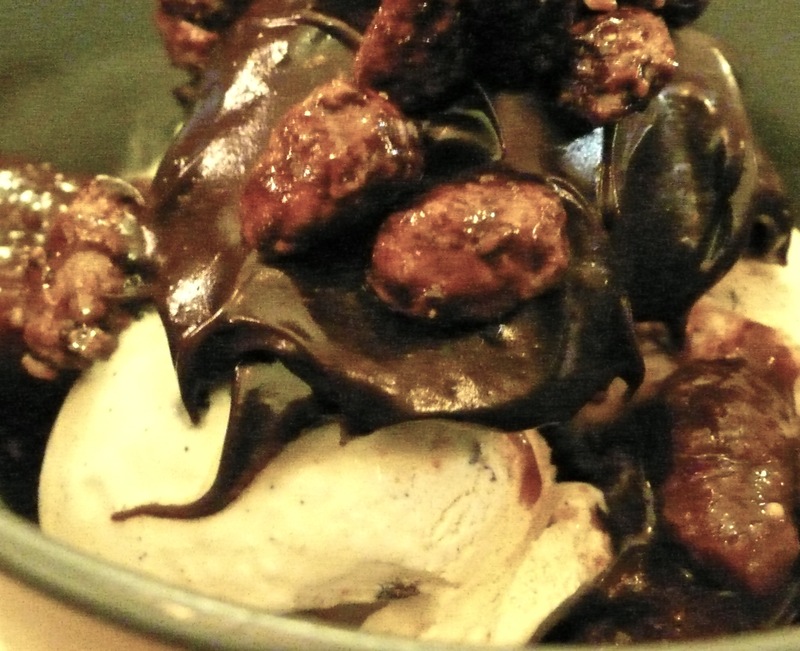 This is home-made ice cream of the most joyous kind – fresh, bright and preservative free. Its going to be served as part of our Thanksgiving! Yum. Makes 2 batches of ice cream, which you can swirl, or leave separate, as you wish. You will need an ice cream maker to ensure simplicity of work – but if you dont have one, freeze the flavoured creams, and every few hours, whizz in the blender until they are frozen and solid. Not as good, but still better than anything you can buy. Combine the heavy cream, milk and vanilla bean (or essence) in a medium pot over medium low heat. Heat the cream mixture slowly, stirring occasionally, until it just starts to steam, and reaches 80C/175F on a candy thermometer. If you dont have one (though you should! Theyre cheap and SO useful!) just wait until the cream starts to steam – about 5 – 10 minutes. While youre waiting for the cream to start steaming, whisk the caster sugar, salt and egg yolks until the yolks are very light and golden coloured. They will be creamy looking. This is just perfect. The caster sugar will have completely incorporated into the eggs as well. As soon as the cream has reached 80C, take it off the heat, count to ten (I dont know why, may be to let it cool a few degrees? Ive always done this though! ), and pour about half of the hot cream into the egg mixture, whisking all the while. Pour the egg cream mixture back into the pot, and return to a medium low heat, stirring constantly. You want the egg cream mixture (your custard) to reach 85C/185F, as you constantly stir. This should only take a matter of a few minutes… You can tell the custard is ready when it lightly coats the back of a spoon, and a line drawn down the middle of the custard on the spoon stays intact. You shouldnt really be stirring for more than a few minutes – you dont want a thick cream, just a lightly thickened custard, with the eggs properly cooked through. Strain the custard into a bowl, top with parchment paper, and allow to cool to room temperature. 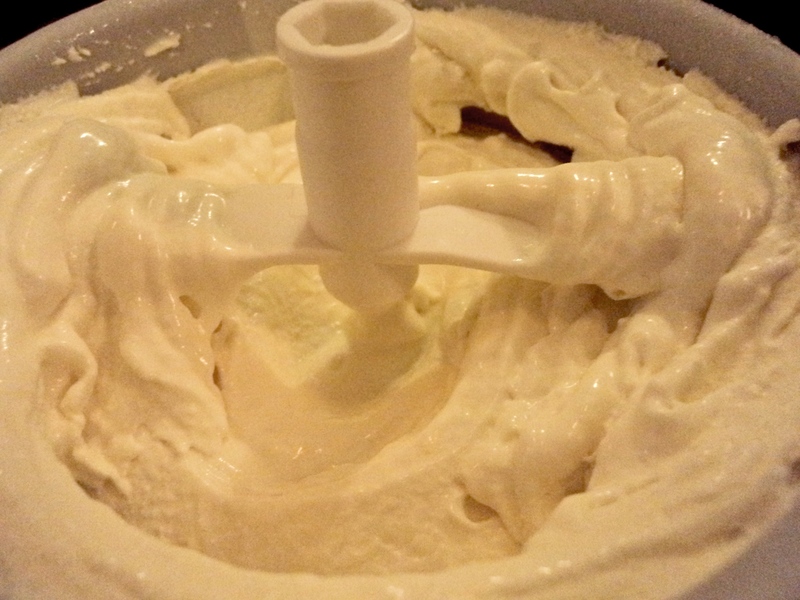 Once at room temperature, put in the fridge for a few hours before making ice cream. In a clean pot, combine the passion fruit pulp and the sugar. Over medium heat, stirring constantly, allow the passion fruit and sugar to incorporate with each other, and the pulp to darken and thicken a bit. This should take between 5 – 10 minutes. The mixture will boil up, and the colour should become a dark yellow gold. As soon as the mixture is to your liking, strain and sieve into a separate bowl. You should have about 1 cup of passion fruit syrup. Allow to cool to room temperature and then refrigerate until cold. Combine the raspberries, sugar and water in a clean pot. Over medium low heat, stir and crush the berries into the sugar and water. They will let go of quite a bit of liquid and become a mushy pulpy bright red mess. They will smell and look totally gorgeous, like the colour of red Burmese rubies. Allow the mixture to boil up, and thicken. It should take only about 5 minutes or so. Sieve and strain the syrup into a small bowl and press the seeds to extract as much juice as possible. Allow to cool to room temperature and refrigerate until cold. Mix together the vanilla custard and passion fruit syrup. If you really want to, add a few drops of natural yellow food colouring, but its not necessary. For a really smooth ice cream, run the mixture through the sieve to ensure that its completely mixed. Pour into ice cream maker, and allow to process for 1 hour. When the ice cream has been made, it will be very soft. Scoop into a container, cover and place in the freezer. Mix together the vanilla custard and the raspberry syrup. If you really want to, add a few drops of natural red food colouring. For a smooth, well mixed ice cream, run the mixture through a sieve. Pour into ice cream maker and allow to process for 1 hour. When ice cream has finished processing, it will be very soft. 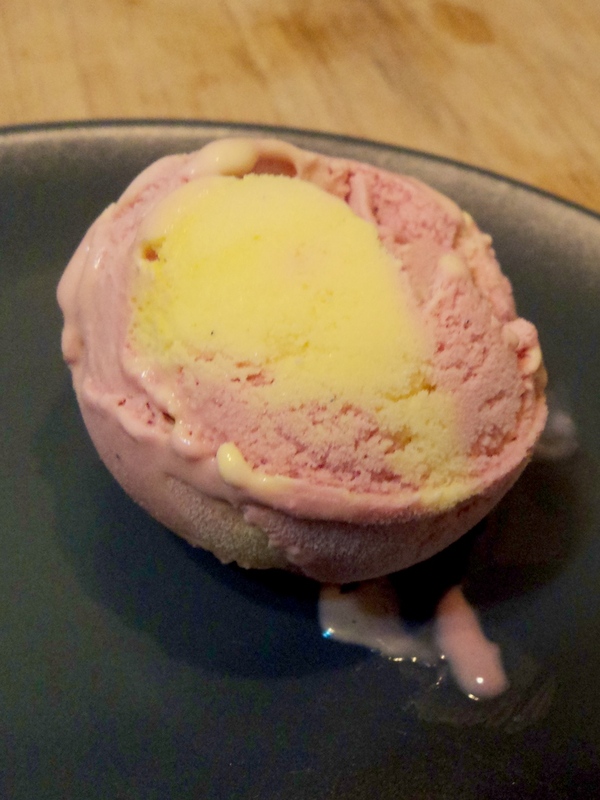 Scoop into a container, and proceed to make passion fruit and raspberry ripple ice cream, or place in freezer. We used a medium sized, rectangular metal baking tin with 3 inch sides. Use whatever shallow container you wish. We scooped out alternating heaping tablespoons of ice cream, three in a row, all the way across the baking tin. We then smoothed over the top, and used a knife, pulled across the tin, to ripple the flavours and colours together. We then covered the ice cream with parchment paper, and plastic cling wrap, and froze for at least 24 hours to allow the ice cream to harden and the flavours to bloom. Absolutely gorgeous, and totally worth the effort! Enjoy! This is food of the goddesses. Sweet, salty, caramel perfection. This is so good, so easy, so quick to make. 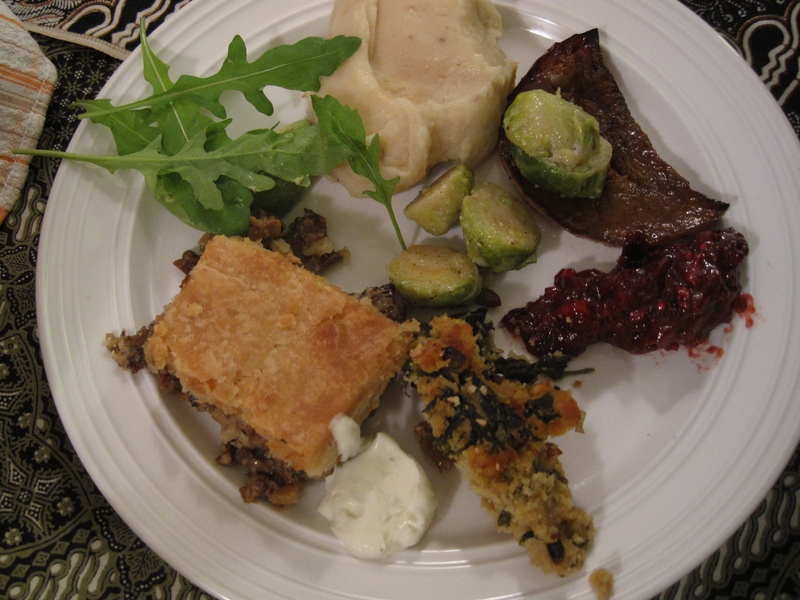 I got it from one of my favourite cookbooks of all times – The Frog Commissary Cookbook – and its used as a stuffing for a sublime carrot cake. Use this as an icing, as a stuffing, or even warmed as a caramel sauce for ice cream or anything else. My nephew likes to eat it straight from the bowl. So do I, which is why I try NOT to have it in the fridge on a regular basis. In a very heavy saucepan, blend well the sugar(s), flour and salt. Gradually stir in the cream. Make sure they are blended – the dry ingredients will slowly absorb the cream. Chop the butter and add to the saucepan, and put saucepan over low heat, stirring gently as the butter melts. You will see the butter getting absorbed into the creamy mixture as it melts. Once the butter has been totally absorbed, stir in 1 teaspoon or so of vanilla. 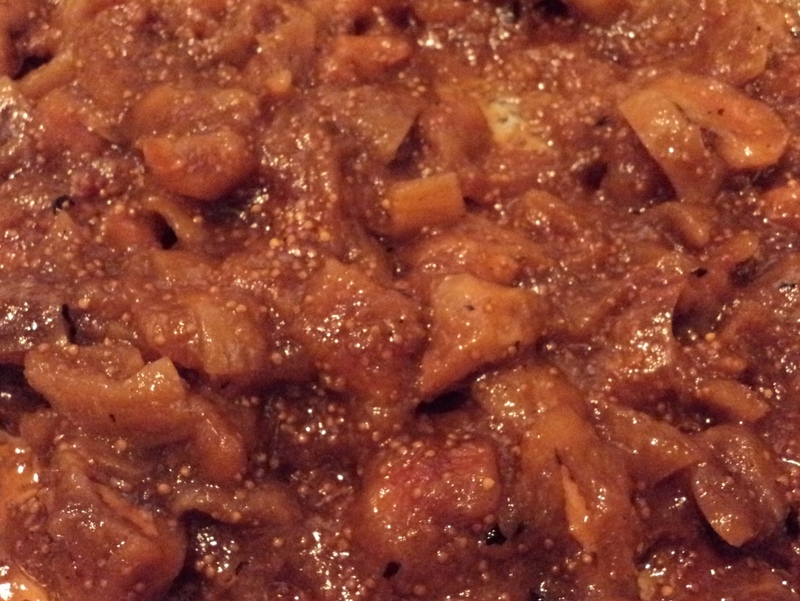 Simmer this ambrosia for a minimum of 30 minutes, and up to an hour, depending on the heat, and how deep you desire your caramel flavour to be. Stir every 5 – 10 minutes. Make sure you stir so the bottom and sides of the pan get scraped down. Once the caramel is golden to nut brown, and the mixture is thick, take off the heat, and add at least 2 – 3 more teaspoons of vanilla, taste, and add a little Maldon or fleur de sel. Stir. Let cool to lukewarm, where you can really taste the flavours, and adjust the salt to your liking.